This student-centered Exploration Routine can be used in many different ecosystems and provides a way for students to search for, observe, research, and share discoveries about organisms. It can be used with any type of organism or phenomenon you choose for students to focus on, such as macro-invertebrates in streams or ponds, under-log organisms, insects caught with nets, or plants. Practice making and recording observations through drawing and writing. Identify and research organisms using dichotomous keys and field guides. Present their findings to their peers. Optional: Think about organisms in an ecosystem through the lens of structure and function. 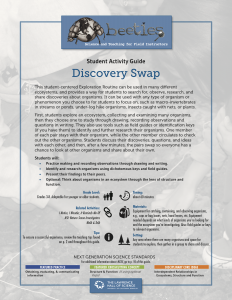 Note: Discovery Swap is best with some trusty field guides or keys for students to use on their own. Check out our list of recommended field guides. Note: This video was edited to focus on how the instructor leads the activity; the actual activity is much more student-focused, and students spend most of the activity exploring and discussing ideas with their peers.